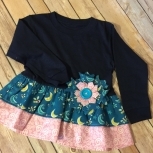 "Child of Mine" by Carter 3-6M 100% cotton onsie has been adorned with an attached bib in orange, yellow and brown material topped off with small orange acrylic buttons. 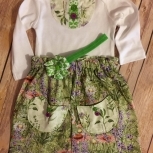 Skirt is made with contrasting material with same colors but a fall leaf motif, has petite pockets with yellow ribbon mock tabs accented with orange buttons. 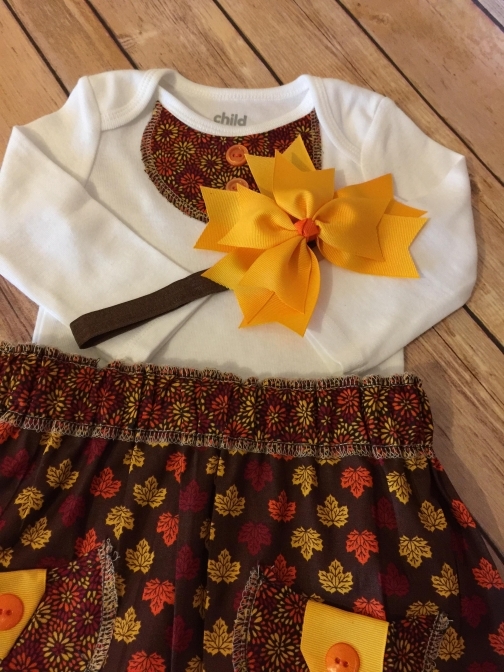 Bow is made with gold yellow crossgrain ribbon and is attached to a stain elastic band created with no raw seams or bumps so fits comfortable on the babys head.